Bonanza Festival–Enter to Win Tickets! 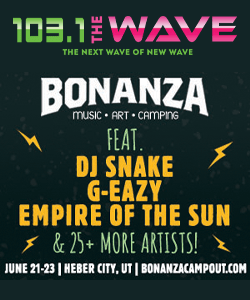 The 2019 Bonanza Music Festival takes place June 21-23 at the River’s Edge in Heber and we’ve got your chance to win tickets! This year’s festival is headlined by DJ Snake, G-Easy, and Empire of The Sun. Enter today for your chance to win tickets to this annual festival of music, arts, and camping! In addition to the headliners, more than 25 artists will perform over the three day event. Check out the full line-up at bonanzacampout.com. Tickets and camping passes are on sale now! Be sure to enter now for your chance to win tickets!